A UN Security Council team has mooted eventually withdrawing peacekeepers from the Democratic Republic of Congo - the world's largest UN mission. The prospect was raised when diplomats on a tour of Africa's hotspots met Congolese President Joseph Kabila in his palace on the River Congo's banks. President Kabila reportedly said he hoped the UN could leave before the next presidential elections in 2011. But it would still be needed for local elections next year, he added. War raged across Congo between 1996 and 2002. Despite the Security Council's optimistic reading of the meeting with President Kabila - one diplomat praised President Kabila's "clear vision" for the country - hostilities still continue in the east of DRC. 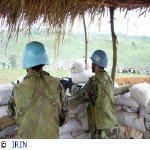 The UN has helped Congo contain the worst of the war here. At its height, half a dozen foreign armies were intervening in the power vacuum left by weak or non-existent central government, with foreign and local soldiers looting Congo's rich resources. In the past few years hostilities have been largely confined to fighting between government and militia forces in eastern Congo, near the border with Rwanda. But the conflict in the east has always been the epicentre of Congo's problems - so until that is resolved, the country will not be stable. Nevertheless, the leader of the Security Council mission, French UN Ambassador Jean Maurice Ripert, was optimistic. Mr Ripert said President Kabila had agreed that once security had returned, the UN forces could withdraw. The French envoy stressed that this would "not be tomorrow". The last presidential elections, in 2006, descended into military confrontation when the results came out between forces loyal to Joseph Kabila and those of his principal opponent, Jean Pierre Bemba. Mr Bemba subsequently went into exile in Europe. He was indicted by the International Criminal Court last month, then swiftly arrested in Europe for leading troops who allegedly committed war crimes. Not surprisingly, in a general reference to the several indictments and arrests the court had made in Congo, including that of his principal opponent, Mr Kabila was reported by a source in the meeting to have said these arrests were "a good thing".